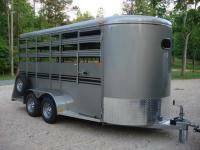 Horse & Livestock Trailer w/Mats, 7ft Tall, Thick Floor Mats, Loaded and Awesome! 6ft X 10ft Deluxe Bee Brand Straight Ramp Load Trailer, 7ft 3in Tall with Escape Door! Macon Custom Trailers & Golf Carts has been visited 9,651,168 times.